Camila Alves looked gorgeous on the red carpet wearing Gabriela Cadena to the 2014 Oscars on Sunday. Celeb makeup artist Patrick de Fontbrune started with Camila’s skin. First, he moisturized her face with vbeaute’s Undercover Agent Anti-Wrinkle Protecting Serum, then patted vbeaute’s Eye Never Anti-Aging Eye Cream around the eye area. After prepping her base, he then used a tinted moisturizer to even out her complexion, but still giving her more of a sheer coverage. 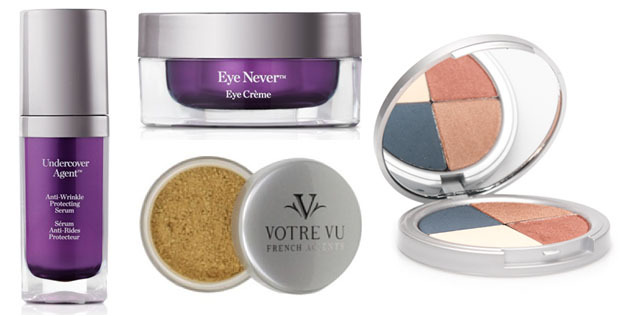 Using Votre Vu Belle Poudre in Golden Medium and Medium, he applied this to her forehead, nose, and eyelids as a primer. He dusted her lids with Votre Vu’s Palette Play in Copper, specifically choosing a brown beige and gold colors together. He then lined her eyes with a soft, black eyeliner and finished her eye look with coats of mascara. Her beautifully flushed cheeks were all thanks to Vu-On Rouge in Amourette (available this coming summer). He then contoured her face with bronzer.